This is my take on a popular pizza. When using Sam’s Club dough balls it takes about 6 hours to thaw and double in size. If you don’t have time to allow it to thaw use, 1 – 13 oz. container of Pillsbury Pizza Crust, which will make one pizza. 1 pizza dough ball from your deli department (I prefer Sam’s club dough balls) One dough ball will make one large pizza with a thicker crust or two medium pizzas with thinner crusts. Place dough ball in a large bowl coated with non-stick cooking spray, cover with plastic wrap, thaw and allow to double in size. Place the chicken along with the BBQ sauce into a slow cooker and cook until chicken breast easily falls apart. This took about 3 hours in my slow cooker, but you can speed up the process by placing it in a preheated oven at 375 degrees for about 30 minutes to an hour or until cooked. The purpose of using the slow cooker is that the meat and juices will be more moist and better combined. Using 2 forks pull chicken apart so it is shredded and stir into sauce. Spray cookie sheet or sheets with non-stick cooking spray. Depending on if you choose to make 1 large or 2 medium sized pizzas. Evenly spread pasta flour over cookie sheet(s), this is to prevent sticking and to make a crispier crust. Using your hands, flatten and shape dough to desired thickness and size on cookie sheet. If choosing to make two mediums, with a large tray, the dough may not make it to the edge of your cookie sheet. That is fine. Try to make a little makeshift edge with the dough to make sure the sauce does not run off the dough during cooking process. 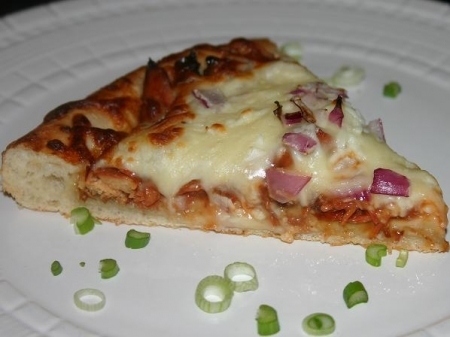 Spread BBQ sauce with chicken over dough, sprinkle with both cheeses, and then top with the red onions. Bake in preheated oven on lower rack at 425 degrees for 15 minutes or until crust is golden brown and cheese is melted.